SIOUX CITY, Iowa (CNS) — Traditional Nativity scenes focus on the Holy Family in a stable where they found shelter. Father Dan Rupp, pastor of Blessed Sacrament Parish, has taken that concept one step further. The priest created the town of Bethlehem — adjacent to points of interest in Sioux City — on two 15-foot-by-5-foot boards. It consumes a space about the size of a double-car garage in the church’s meeting room. “Nope, no union help today,” he quipped. “But it did take a minivan, pickup and my (Chevrolet) HHR to transport everything. Normally, it’s in the basement,” he told The Catholic Globe, newspaper of the Diocese of Sioux City. Father Rupp got the idea for the village while visiting Naples, Italy, where artisans literally embrace the sentiment “it takes a village” to display a Christmas crib, or “presepe” as the locals call it. He has been working on his presentation for about two years. Father Rupp confessed he took a great deal of artistic license with the project. “It’s a Bethlehem of sorts,” he said, of his eclectic choices. Down the street from the inn, which is more like a Hilton than a Motel 6, is a three-story Jewish temple. Across the perfectly carved cobblestone road is the Roman Coliseum, with flags waving around the circumference. “No, there are no Hawkeye or Big Red pennants,” he said, referring to the universities of Iowa and Nebraska, respectively. “Besides, I’m a Cyclones fan,” said the priest of the mascot at Iowa State University in Ames, where he earned a bachelor’s degree in electrical engineering. It was while working as an engineer in Burlington, Vermont, that Father Rupp decided to enter the seminary. Those engineering skills did not languish. He was in charge of the portable sound equipment at Mount St. Mary’s Seminary in Emmitsburg, Maryland, when St. Teresa of Kolkata visited in 1995. Ordained in 1998, Father Rupp was assigned to parishes in Vermont before returning to Iowa in 2013. He was named Blessed Sacrament’s pastor the following year. To create the elaborate replicas for Bethlehem, Father Rupp used Styrofoam and heavy cardboard. He also showed off his plumbing and electrical chops. A fountain sports running water. Power cords may be hidden from view, but when discovered, would be enough to make any audiovisual aficionado drool. The dainty white lights that can be seen — and there are tons of them — glisten in the night sky, which is a blue board behind Bethlehem. Red lights make it appear as if the home fires are burning in the houses. Father Rupp couldn’t calculate exactly how much sweat equity has gone into the construction of the display. “I do know just constructing the Cathedral of the Epiphany took 40 hours,” he said. The cathedral is joined with other notable Sioux City buildings on its own platform. There, one can see the Woodbury County Courthouse, the former Central High School, the Peirce Mansion, First National Bank, the Hard Rock Hotel and Casino and Blessed Sacrament Church, which also appears in Bethlehem by the choice of the artist. As they say in architecture, “God is in the details,” and Father Rupp agreed with that. Outside the stable is a field of sweet corn, sunflowers, cauliflower and lettuce. Peek inside a palatial home and there is a miniature table and chairs. Outside the same structure is a modern bicycle, contrasting the wealth of the owners who used this mode of transportation rather than the donkey Mary and Joseph rode. 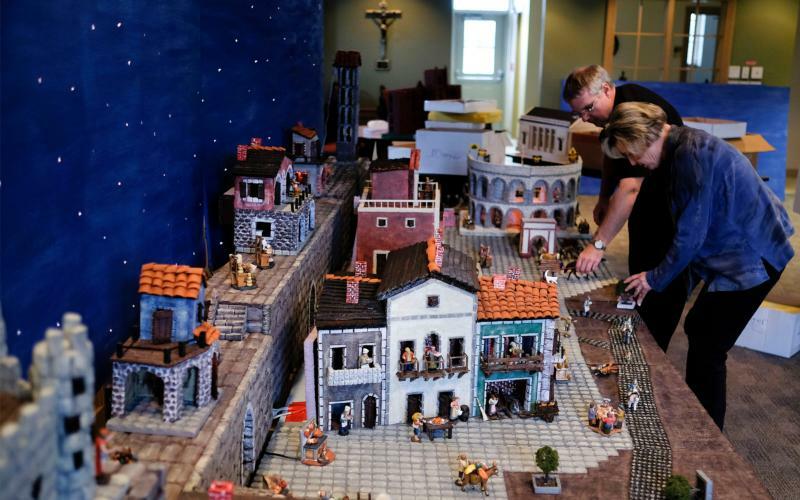 Hundreds of figurines — most are from Naples — inhabit the village. Others that are not time-sensitive, including Chewbacca from Star Wars, grace the display with their presence. The finished product, the pastor added, also has therapeutic results.